Pasta Puttanesca works well served at an elegant party or for a special date, but kids and families love it too. The only fat is the healthy olive-oil that's in it, so it's great for those watching fat or cholesterol. The olives and capers do add a lot of sodium, however, so if you are on a reduced sodium diet, you may want to try the Pasta with Fresh Spinach and Garlic (listed below) instead. 1) Prepare olives and set aside. 2) Pour about 2 tbsp. of olive oil into large skillet on medium heat. Add garlic to pan and sauté for one minute. Do not burn the garlic. Add the dried basil and crushed red pepper. 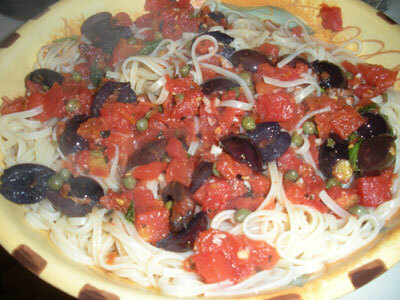 3) Add olives and sauté another minute or two. 4) Add the can of diced tomatoes, including liquid, and stir. 5) Add capers and caper juice, and pour in the 1/2 cup of water. Add a little bit more olive oil. Simmer for 5-10 minutes. 6) Prepare pasta according to package directions while sauce is simmering. 7) Add fresh basil a minute before serving. 8) Toss pasta and sauce together and top with parmesan cheese, if desired.